Analysts at J.P. Morgan have said that an approximate $5 billion insured industry loss from hurricane Matthew would see reinsurers front roughly 50% of the bill, and would see Europe’s big four reinsurers call on divergent levels of retrocession. Insurance and reinsurance industry loss estimates from the impact of hurricane Matthew, one of the strongest storms to impact Florida and the U.S. in years, continue to come in from risk modellers and market analysts. CoreLogic had been the first to put out an estimate at $4 billion to $6 billion. The newest estimate today, from AIR Worldwide, noted a loss of up to $8.8 billion for U.S. and Caribbean losses from the event, while Karen Clark & Company (KCC) estimated a loss of around $7 billion for the U.S., and so estimates seem to be converging on the $4 billion to $6 billion range, perhaps a bit more. Utilising an insurance and reinsurance industry loss range of $4 billion to $7 billion, analysts at J.P. Morgan have given some insight and estimates into the impact on the re/insurance market should Matthew result in a roughly $5 billion insured loss. Despite Europe’s big four reinsurance firms having reduced their exposure to U.S. windstorm in response to lower pricing which, along with flood losses in the region typically being covered by the State suggests that reinsurers could take a lower portion of the overall loss compared to previous events, J.P. Morgan still expects reinsurers to cover roughly 50%, or $2.5 billion of the loss. The other half, or remaining $2.5 billion will be retained by the affected primary insurance companies, explains J.P. Morgan. 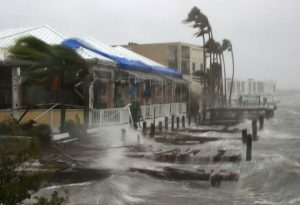 Interestingly, the firm also gives some insight into how a $5 billion loss from Matthew could impact the marketplace, and in particular Europe’s big four, being Swiss Re, Munich Re, Hannover Re, and SCOR. The firm estimates that both Swiss Re and Munich Re will take a 10% share of the overall loss to be borne by the reinsurance industry, so $250 million, of which J.P. Morgan believes 90% will be retained by each company, meaning that 10% of the loss will be covered by firms’ individual retrocession cover. 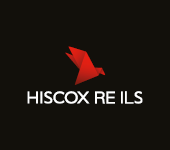 Whereas for Hannover Re and SCOR the story is slightly different, with the former estimated to take a 6% ($150 million) share of the loss to be borne by reinsurers, of which the company will retain 75%. SCOR is also expected to retain 75% of the loss but is estimated to take on a 3% ($75 million) share of the loss, so the lowest of the big four European players. The above highlights that both Hannover Re and SCOR, while less exposed to the event, are expected to utilise a greater share of retrocession protection to cover any losses from hurricane Matthew, when compared with Swiss Re and Munich Re. J.P. Morgan also provides a breakdown of estimated losses for each company after tax and post retrocession, which would see Swiss Re face a loss of $167 million, Munich Re $180 million, Hannover Re $84 million, and SCOR $42 million. 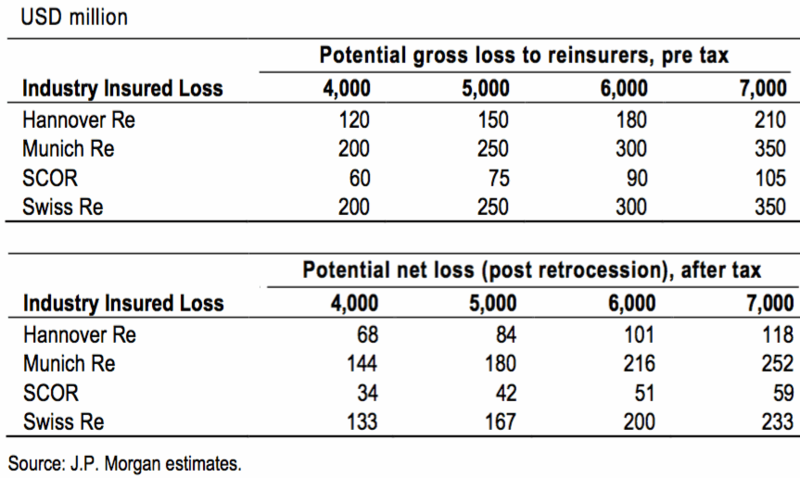 As highlighted by the table below provided by J.P. Morgan, the loss estimates vary from as low as $34 million for SCOR and as high as $252 million for Munich Re, dependent on the size of the overall insurance and reinsurance industry loss. “Comparing the net loss to our FY16E net income and book value estimates shows that the event may range from around 6% of net income in a $5bn scenario to on average 9% of net income in a $7bn insured loss scenario. When compared to FY16 book value this is less than 1%,” said J.P. Morgan. Analysts from J.P. Morgan explain that despite the impact of hurricane Matthew it is unlikely that catastrophe budgets for the year will be exceeded, in line with predictions from other market analysts in recent times. “We estimate that (pre-Matthew) the remaining cat budget for the year, was equivalent to around 24% of our FY16E net income estimates across the sector, so if the cost is ~6% of net income, this suggests the remaining buffer has been reduced by around one-third. Given this buffer still exists, we see very limited downside risk to estimates at this stage; indeed, our own estimates for FY16E are unchanged,” explains J.P. Morgan. Reports and estimates for the impacts of hurricane Matthew suggest that insurers and reinsurers will be able to manage the loss fairly comfortably, but it is worth remembering that owing to the ongoing softening landscape and reduced profitability, reinsurers have little room to manoeuvre in the face off large losses. And of course if 50% of the eventual hurricane Matthew insurance loss falls to the reinsurance industry and capital providers to pay for, some of that will fall to insurance-linked securities (ILS) funds and their investors, as well as other third-party capital collateralised reinsurance structures. – AIR puts hurricane Matthew insured loss at up to $8.8bn. – FedNat to call on reinsurance for hurricane Matthew, HCI to retain. – KCC puts hurricane Matthew insured losses at $7 billion. – Heritage puts Matthew losses below $100m, Citrus Re cat bonds safe. – Matthew losses to largely fall within catastrophe budgets: Peel Hunt. – Laetere Re & First Coast Re cat bonds trade down on Matthew. – Cat bond index in biggest drop since 2012 on hurricane Matthew. – Early Hurricane Matthew insured loss estimates suggest up to $6bn. – ILS investors to share “material portion” of Matthew loss: Dubinsky. – Hurricane Matthew a test for re/insurers, ILS: Rating agencies, analysts.